It was a righteous goal. But a difficult goal. A valiant little group of young women from Prescott, Arizona so inspired by the announcement of a new Phoenix temple that they wanted to pay tribute to John Rowe Moyle. A simple man with a profound dedication to building the Salt Lake temple back in the 1800’s. A stonecutter who walked 22 miles to the temple site each week even after an accident caused him to lose his leg. A man we wanted to exemplify. And so we gathered during the dark, wee hours of the morning two years ago for a trek to the Phoenix temple. Feeling strong and positive. Air in our lungs. And smiles on our faces. A couple of miles into our journey the sun peaked over the horizon. Silhouettes of saguaro cacti appeared as the light broke through. We felt alive and encouraged. We can do this. At mile ten our spirits were strong, but physical ailments started to emerge. Faces sweaty now with eyes beginning to show fatigue. “You’re almost halfway!” the leaders shouted. The thought of repeating what we had already done was daunting. It felt like we had been walking all night. Breaks were taken to care for blistered feet. Duct tape became our best friend. Why finish? Doubts began to take our focus. Aches in our feet had now moved up our legs into our backs. Physically we felt done. But we squared our shoulders and continued. The scenery changed from desert landscape to city cement. Oh ... how much longer? And then we saw the messages. 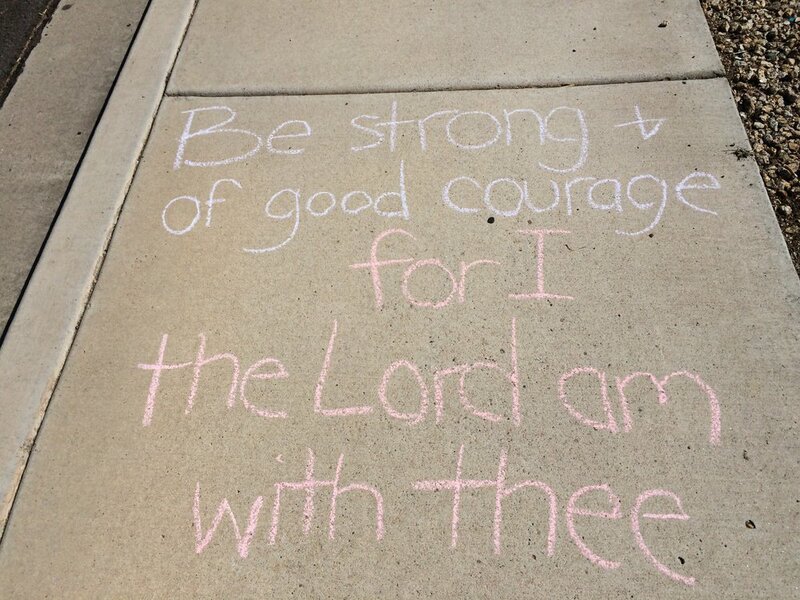 Words of encouragement scribbled on the sidewalks with chalk. A simple gesture which gave us renewed determination to finish. Inspirational words making a difference. The sun’s direct heat was felt by mile fifteen. We met at a church building along the route for a much needed lunch break. It was hot and we were tired. We needed time to feed our bodies … and our spirits. The symbolism of arriving at a church building in need of nourishment was not lost on me. A time to refuel. To remember why we were here. We spoke of courage and strength. We sang hymns. And laughter and joy was in the air again as we stood on aching feet and set off for the last seven mile stretch. Soon we would encounter new terrain. The last few miles were the hardest of the entire 22-mile journey. Over a mountain pass. No smooth cement sidewalks, but rocky, uneven trails. Leaders promised that we would see a glimpse of the Phoenix temple just over the ridge. Oh – how we longed for the sight. Our feet pulled us up the final ridge. As we pulled our bodies up over the summit we saw a speck in the distance. The Phoenix temple. Tears filled our eyes and our souls were lifted as we stood and took it in. There are beautiful, artistic impressions and photographs of the Phoenix temple. But none that measure up to this. It will forever be a very personal and special first glimpse of that temple. Now just the final stretch. One of the girls began to get painful leg and back cramps. Her mother was in the group. Two spirits fighting to finish with honor. I thought about life’s struggles. Enduring to the end. One foot in front of the other with eyes looking forward. A steadfast focus on Him. An understanding that hope is real and eternal promises will be kept if we just keep moving. We are never alone. Strength beyond our ability is real. Sometimes it’s a shoulder to lean on. Sometimes it’s a scribbled message that lifts us. Sometimes it’s comfort that is not seen … but felt. Over 100 years ago John Rowe Moyle limped his way to the Salt Lake City temple, climbed the scaffolding, and with a chisel in his hand hammered out the declaration Holiness to the Lord. 22 long miles. An inspirational memory of 20 beautiful, dedicated young women. 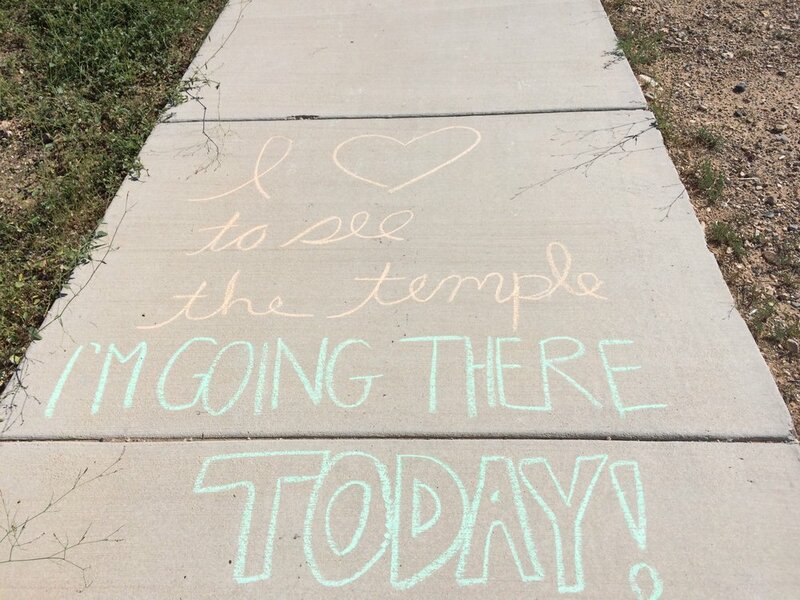 And a commitment to attend the temple.